A concept diagram is a sketch to see what will fit into a given space. Additionally, I can use the profile capabilities in XTrkCAD to estimate track length and grades. Only the fittest concepts move on to become detailed plans. Concept #3 is a partial mushroom design. That avoids the ceiling beams and heating ducts. The focus is on the SRRR (Farmington to Phillips) and the F&M (Strong to Bigelow). It reflects that modeling the P&R (Phillips to Rangeley) is not that important to me. 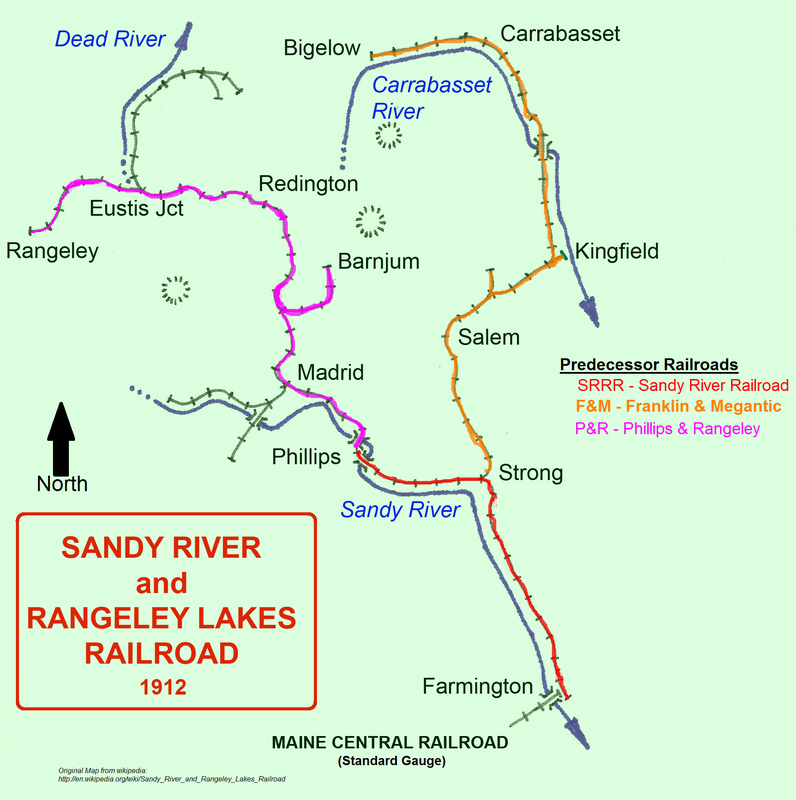 In this design, Bigelow and and Carrabassett on the F&M are mushroomed above Mapplewood and Farmington of the SRRR. Bigelow is viewed from the inside of the peninsula and Farmington is viewed from the outside. The emphasis of the layout is on the SRRR (Farmington to Phillips) and the F&M (Strong to Bigelow). Both are well represented with the SRRR being 121′ and the F&M being 98′ in length. The P&R (Phillips to Rangeley) is represented by Rangeley staging below Starbirds. In general, I’m OK to omit the P&R, as most of the modeling redundant to the F&M, it is logging and lumber. Bigelow is tight. The 4 feet for the sawmill is not sufficient to do it justice. Farmington would probably be acceptable. Farmington’s upper yard would either be skipped or bent around the peninsula. Strong has it’s natural curve to the left (going north from Farmington) and Phillips has ist prototype curve to the right (going north from Strong). Kingfield, as the hub of the F&M is grossly underwhelming. Quite likely Kingfield would have to be freelanced significantly, possibly without a stub. The Kingfield/Farmington aisle is tight. I’m not sure there is sufficient room for operators. This layout is on a continuous grade around the outside of the room. The bottom is Farmington (40″) and the top is Bigelow (62″). I’ve not calculated the grades, but I think grades around 2% could be used. The Carrabassett and Mapplewood areas could be quite thin, so could be back to back rather than a mushroom. A cool feature of the layout is the nod-under. The track elevation would be 57″ or so, so a 55″ clearance could be had to enter the room. I’d see the Bigelow aisle having a 5-8″ platform. A gate would be provide to directly enter the layout. At roughly 52″ around Salem/Starbirds there is sufficient clearance to clear the sink and workbench. Each crew would have it’s own engine, so that’s only 6-8 engines locomotives (Reasonably close to the current 5 available). A railroad like this is a life time project (20 years or more). So I’d like to have phases. Here’s how I see the phases. Phase 5: Correct Strong, build Phillips Peninsula, and add Rangeley Staging. These phases seem very reasonable, Truly a railroad that grows and grows no bigger than desired at any phase. The layout would be operational at each phase of construction. Reasonable project with good phasing for construction. Includes the my top locations to model. This entry was posted in Layout Design, The Dream, Uncategorized. Bookmark the permalink.